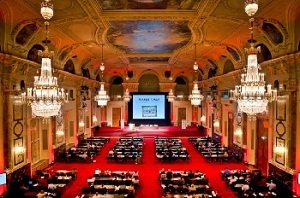 SPECIAL REPORT: LabHomepage attended the 9th Planet xMap conference and symposium, held at the Hofburg Palace in Vienna, Austria. With nearly 500 delegates and almost 40 papers presented in 12 sessions over two days, Planet xMap is a significant scientific symposium in its own right. What makes it particularly compelling for me, writes LabHomepage editor Russ Swan, is that the topics under discussion are pretty much at the cutting edge of biomolecular science and clinical diagnostics today. Planet xMap is organised and sponsored by Luminex, and centres around the development and application of its microbead assays. This technology enables a vast increase in the number of reactions that can be performed in an assay – up to 500 per well. In a standard 96 well microplate, that means that almost 50,000 diagnostic tests or research experiments can be performed simultaneously. More typically, 100 different reactions are performed per well, giving a multiplexed output of up to 9600 tests per microplate. Key to the technology is the use of microbeads or microspheres – tiny polystyrene beads measuring just 5.6um (microns, or micrometres) in diameter. These are dyed with a combination of red and infrared fluorophores, the exact combination of which serves to identify the specific bead. 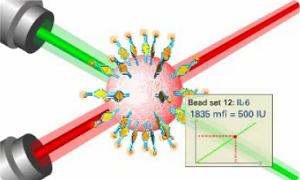 Beads of a given dye combination are treated with specific binding agents – antibodies, oligonucleotides, peptides, or other receptors – effectively making each bead a platform to separate specific constituents from the material under investigation. By reading the combination of dyes with a red laser, and simultaneously reading fluorescence from the analytes with a green laser – the so-called reporter channel – the multiplexed assay can be deciphered and valuable information gained from the sample. At Planet xMap, prominent users and developers of the technology gather to share their recent experiences and learn from each other. Luminex licenses its technology to partner companies, enabling them to develop and market their own xMap-based systems and therefore encouraging novel applications of the core system. It is an approach that makes a great deal of sense, and is I think a little like the philosophy of one of the main players in the current market for tablet computer and smartphone software. Where Apple retains centralised control over what can be done with its iPod/iPhone platform, Google adopts a more open view with its rival Android system. Anybody can develop an app for Android, provided of course that they have the technical skills, and can even make their own versions of the platform itself. Luminex adopts an enlightened approach along these lines, and seems to be profiting from it. Alongside the scientific programme of Planet xMap, about 20 exhibiting companies from Millipore to Life Technologies, Bio-Rad to Tecan, were demonstrating their own latest innovations based on the xMap platform. The main focus of attention, though, was the technical presentations. Two keynote presentations in particular stood out for me. Dr Matthew Albert of the Institute Pasteur outlined how current treatment for Hepatitis C (HCV) is a combination of pegylated interferon and ribavirin, but noted that this is only effective in less than half of patients. Using multi-analyte profiling via the xMap system, Albert and his team have been able to identify pre-treatment predictors to determine which patients will benefit from the treatment. Not only does this save at least half the cost of medication, it also means that those patients who would not benefit are spared the ordeal of ineffective treatment. Dr John Connolly of the Singapore Immunology Network also addressed an issue that, like Matthew Albert’s, is a pointer towards a future of truly personalised medicine. Highlighting the perturbations in cytokine and chemokine networks during the course of a body’s immune response to disease, Connolly outlined how a multiplexed cross-assay immunomonitoring procedure which was amenable to high-throughput automation can be applied to the analysis and monitoring of a variety of human conditions from cancer to allergies. Planet xMap proved to be a stimulating couple of days based in and around the palace that was once the very centre of power of the Austro-Hungarian empire. Today it seemed more like the epicentre of developments in key areas of scientific progress, including immunodiagnostics, molecular diagnostics, proteomics, and pharmacogenomics. Disclosure: LabHomepage attended Planet xMap 2011 as the guest of Luminex. We were not paid to attend, or to report on the event, and Luminex neither asked for nor was granted any influence over our coverage. All views expressed are our own.